Relax on the chaise lounge and appreciate the stunning armchair views of the forest. Enjoy a glass of champagne in your deluxe candle lit spa. Sip a cup of tea on your private balcony and feel a serenity that only comes from being close to nature. The three Heritage Trail Lodge Margaret River Luxury ‘Indulgence’ Spa Suites have the best of everything, being recently refurbished with designer artwork and décor and the highest quality furniture and fittings. An impressive feature window and large private balcony faces directly into to the beautiful Karri forest of the Bramley National Park that adjoins the back boundary of this very special Margaret River hotel. Beautiful and Cosy. We stayed in the best (luxury spa suite) room this place has to offer and every penny spent on it was worth it. Beautiful, big and supremely cosy room making our experience all the more enjoyable. Spa was just the best :) TV, Fridge and all the other amenities in the room were in great condition...We are definitely coming back :)"
The ultimate in luxurious Margaret River accommodation, the three individually themed Luxury ‘Indulgence’ Spa suites have been inspired by Margaret River Region attractions. Each Luxury Suite has been decorated with a different theme to reflect the best the South-West region has to offer. A tribute to the areas surrounding giant Karri forests, the “Boranup Suite” with its relaxing green hues of the forest is designed to let you unwind in total comfort and soak up the tranquil atmosphere of the forest. The sea and beach theme of the “Yallingup Suite” was inspired by the world-class surfing beaches of Yallingup town and the iridescent blue of the Indian Ocean. The “Leeuwin Suite” with the rich, earthy shades of the autumn vineyards is a celebration of the Margaret River Region’s famous food and world class wines. The Heritage Trail Lodge Margaret River has been awarded Green Star Accreditation for its eco-aware practices. Luxury Accomodation in a Gorgeous Setting. Comfortable room with a huge tub and views of the surrounding forest. The staff were very friendly and helpful. It was very close to a walking trail and also the town centre, so very convenient. Absolutely loved it!" Bed Configuration: Designed for couples, the Heritage Trail Lodge hotel Luxury Spa suites all feature deliciously comfortable king bed accommodation. For an additional charge, a single roll-away bed per suite is available for an extra adult or child. There is no charge for children who sleep in the existing bedding with their parents. Maximum occupancy per suite is 3 people. NOTE: Check the Acccommodation Specials page for Margaret River accommodation deals and website exclusive offers throughout the year. A variety of exciting Accommodation Packages are also available. Awarded Perfect Honeymoon Accommodation 2019! 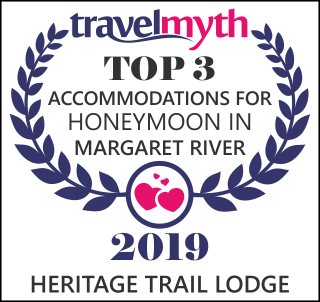 The Heritage Trail Lodge is now ranked in the top 3 accommodations for honeymoon in Margaret River.